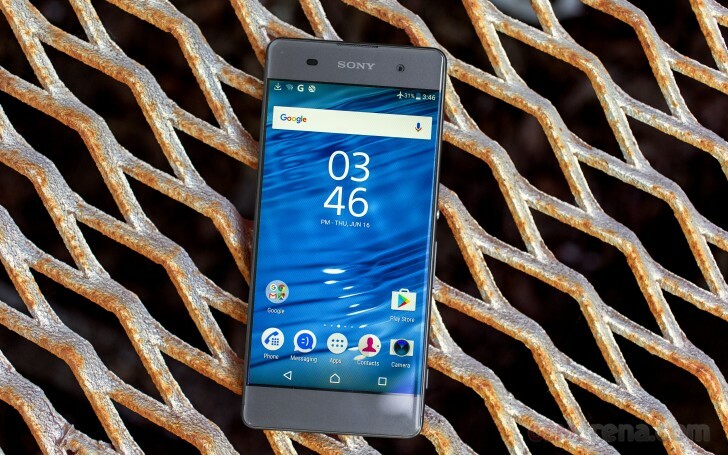 The Sony Xperia XA uses a MediaTek chipset like the XA Ultra, while the X duo went with Qualcomm. The chipset in question is the Helio P10, which houses eight Cortex-A53s clocked at 2GHz and a dual-core Mali-T860. They share 2GB of RAM. For comparisons we mostly picked out phones with 5" 720p screens. A lot of them in this price range use a Snapdragon 616 (8x A53 + Adreno 405). That's the Galaxy J7 (2016), Oppo F1, Vibe K5 Plus and Redmi 3. The Xiaomi Mi 4s flies high with Snapdragon 808. Then there's the Xperia X with S650, the successor of the 808. AnTuTu 6 placed the Xperia XA in the middle of the pack - behind the higher end Snapdragons, but ahead of the 616s. The J7 (2016) scores surprisingly high. It's not a fluke either, the Galaxy does well in Basemark OS 2.0 too. Here the Xperia XA leads most phones, including the Xperia M5 (which is a sort of spiritual predecessor to the XA). Note that Geekbench 3.0 failed (couldn't upload the score to the server). Flipping over to the GPU side, we see that the XA matches the X in on-screen performance. Obviously, the difference between 720p and 1080p resolution helps, but you can expect identical game performance between the two phones (not counting the less sharp screen image). The Adreno 405 in Snapdragon 616 doesn't do too hot even at 720p, while the Adreno 418 sweats to push 1080p to Xiaomi Mi 4s screen. Offscreen performance shows the dual-core Mali-T860 is about half as fast as an Adreno 510 in the Xperia X. That's proportional to the difference in pixel count, making the Helio P10 the right tool for this job. Basemark X takes offscreen performance into account, which explains the higher scores of the X and Mi 4s. 2GB of RAM may sound cramped, but the Xperia XA did a fine job of switching between apps fast. Only the more demanding apps (typically games) got booted out of RAM and had to be reloaded after several app switches. The processor is fast for a mid-range phone, though you can get more bang for the buck with some smart shopping. The GPU is all that the 720p screen needs, mid-rangers with 1080p screens need a faster GPU (and those phones aren't cheap), so all in all a good job by the Xperia XA here.